Vegetables are amazing. I mean, there’s kohlrabi, which looks like nothing quite so much as a purple and green UFO camouflaged with a few leaves in order to lurk in your home gardens and probe the tomatoes and eggplant undetected. There are lumpy and bumpy and spiny cucumbers, amazing zebra-striped tomatoes, tenacious snap peas, and, of course, the artichoke. The artichoke is a testament to human ingenuity, as I am still baffled as to how anyone ever figured out that the artichoke bud was edible. 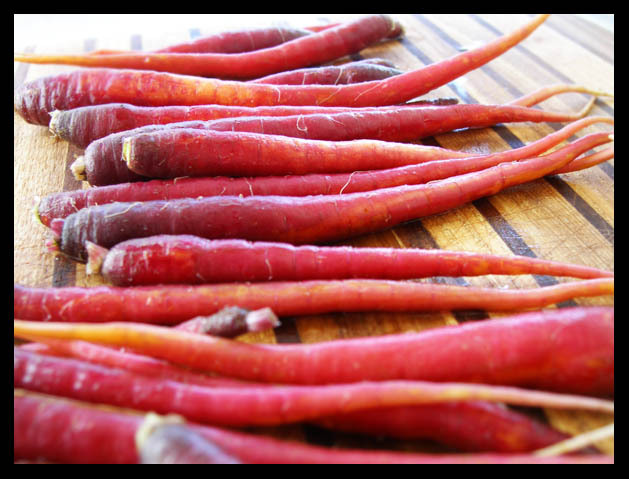 In addition to all the oddball shirttail relations of Veggieland, however, there are the gorgeous cousins, like these sunset-hued, violet-red carrots. We took home a bunch each of the last two weeks from our CSA, which meant that it was definitely time for carrots for dinner at our house. My first inclination was to roast them with some of my wonderful WildTree lemon-infused grapeseed oil, salt, and maybe a bit of dill, but it turns out that the little dill babies the neighbor gave us last week are still a ways away from being bulked up enough to provide dinner. I decided to roast the carrots anyway, though with an alternate ultimate goal: a delicious, creamy carrot soup. I had been wanting to experiment more with vegan versions of creamy soups, and the carrots seemed to be just the ticket. I had made some cashew milk (just like my almond milk, but with cashews) the day before, and I still had all the thick, creamy cashew pulp in the fridge. Perfect, I thought. (Actually, it was more like, “Eh, what the hey,” but that’s sort of how I roll in ye olde kitchen.) Carrots and cashews seemed like a wonderful combination. When the Unicyclist and I have special events to celebrate, our restaurant of choice is Tarbell’s here in Phoenix. The food is superb–the ingredients are painstakingly sourced (mostly organic and local), the dishes prepared with care, and the presentation is beautiful. Last year, probably around this time, we had an amazing parsnip soup there, which inspired this attempt for the Dark Days Challenge. Although it wasn’t quite as good as Tarbell’s (I haven’t found any place yet that is, not even my kitchen), it was quite good. Best of all, it’s simple, with only a few ingredients. Give this a try before parsnips are out of season! The centerpiece of yesterday’s marjoram-themed lunch was a thick, creamy bean soup featuring herbs from our patio garden. This is a high-protein soup ideal for cold days and hungry bellies, and it was made even better by grilled focaccia with garlic and marjoram. The soup starts with a pound of Colorado River beans which I had soaked and pressure-cooked the day before and then stored in the fridge. I found these beans at Native Seeds in Tucson some time ago, and I was curious about them They’re pretty–small and pale with purplish markings. It turns out that they’re mild and keep their shape well when cooked. It also turns out they make for very tasty soup. 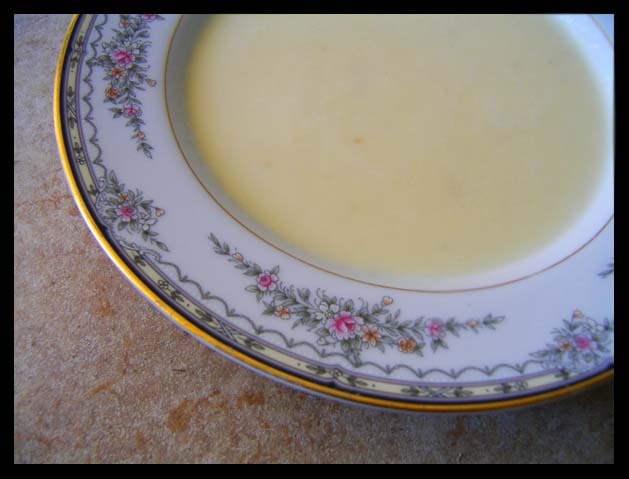 The bisque was also a way for me to use up some leftover rice I had in the fridge from an earlier meal. It is a blend of several different varieties of rice, including some wild rice. 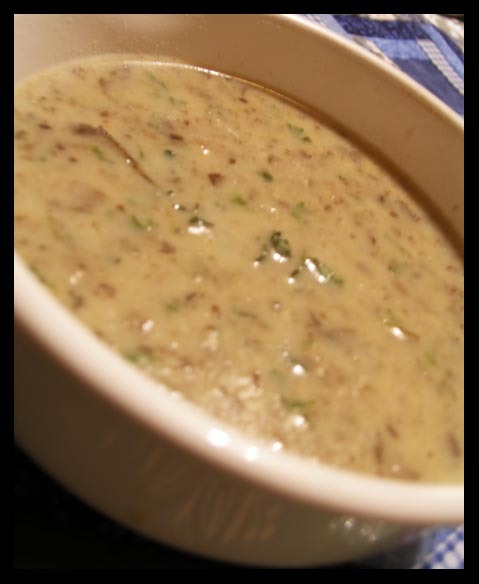 The combination lends a nutty, earth flavor, which balances the soup well and adds a pleasing texture. Finally, it allowed me to experiment with the shallot I had bought for the French Dijon vinaigrette. Not a bad deal. That’s another key element of keeping things simple–become comfortable planning your recipes based on what you have on hand. 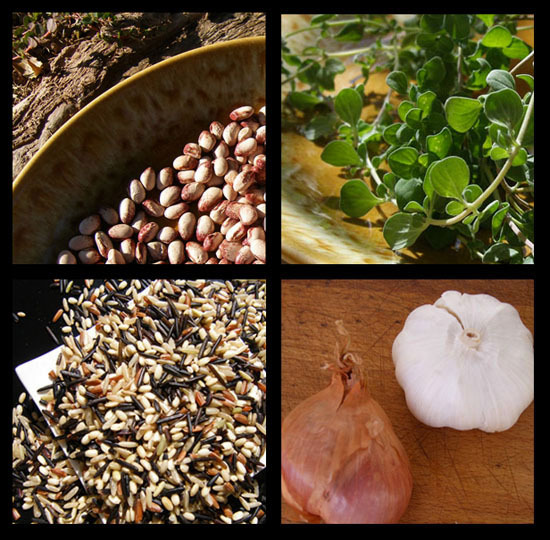 Like, let’s say, just hypothetically…marjoram and leftover rice.